After a futile year, plain-clothes cops Freebie Waters and Bentio 'Bean' Vasquez discover evidence linking big-time mobser 'Red' Meyers from Detroit gangsters and knowing a 'hit' will demolish their efforts, Freebie and the Bean try to arrest Meyers on a trumped up charge of indecent exposure. Big repercussions result n a servere reprimand from the D.A. who instructs them to keep Meyers alive until the return of a corroborative witness. During the following three days Freebie and the Bean create chaos in the streets of San Francisco as they protect Meyers. Car chases take them down one way streets the wrong way, across open air markets and even into the third floor bedroom of an apartment block. When they are finally ordered to pick up Meyers he is being accompanied by a mysterious blonde as they head for the big match at the bowl. The 'blonde' is not what 'she' seems; the Bean is wounded; and Meyers has a heart attack. Freebie is back where he started - or is he? 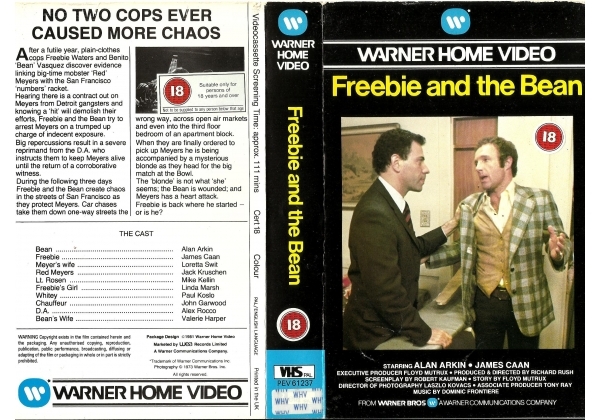 Or find "Freebie and the Bean" on VHS and DVD / BluRay at Amazon.